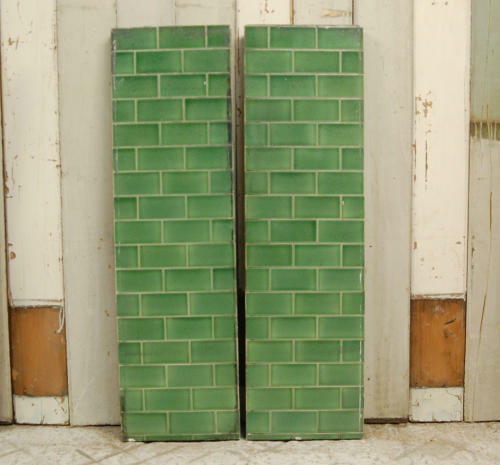 A pair of heavy, concrete backed, metro style fire tile panels. The tiles are an attractive light green, a typical colour of original metro tiles ,and are complimeted by white tile grout. The panels are designed frame a fire, within a hearth, to add style and give protection against heat. The concrete gives the tiles protection and provide a sturdy base. The tiles are reclaimed and therefore have some signs of wear but are solid and useable. The tile glaze has cracking and crazing, giving a character, period look. The tiles have some slight fading and slight chipping to the colour in places but are in overall very good, antique condition. There are some small chips to the tile edges and the concrete. There are some marks and stains from smoke and where the panels were previously secured. The panels would be a lovely edition to a fireplace but could also be used in a number of ways for a house design project. The tiles could also look fantastic in the garden, kitchen or bathroom. A versatile and attractive set of tile panels. Metro tiles are currently very popular and the tiles are very desireable. We have a similar pair of tile panels available for sale. Please see FX0004.